Even more evidence that Obama is Muslim — 1389 Blog - Counterjihad! There are just too many instances of Obama doing and saying things no Christian would ever dream of doing or saying, but which would be normal utterences or behaviors for a Muslim. Supposedly he’s been a Christian for what – at least 15 years? – yet his public actions consistantly dispute such a notion. He refused to speak in the presence of a cross [spelling corrected]; it had to be hidden beneath a cloth. In another speech he sarcastically wondered hypothetically which religious lessone might be considered to be incorporated into governing, and very snarkily cited several Old Testament battle/brimstone verses. He was clearly amused by his ridicule of Jews’ and Christians’ holy book. In his Cairo speech he said “I have KNOWN Islam on three continents before coming to the region where it was first REVEALED”. You can observe a religion; to “know” it, you must belong to it. And ONLY a Muslim is going to describe Islam as having been “revealed”. Still Cairo: “American are ready to join with citizens & governments, community orgs, religious leaders, & businesses in Muslim communities around the world to help OUR PEOPLE pursue a better life.” “Our people” – he’s including himself – can only mean Muslims as most Americans already have the best life possible. And he said, “The Holy Koran teaches that whoever kills an innocent, it is as if he has killed all mankind, and whoever saves a person, it is as if he has saved all mankind.” His audience was Muslims, so they know “the rest of the story”, which is that this “all mankind” in the Koran refers to believing Muslims only. Jews and Christians are never referred to collectively with Muslims. And, “…in the United States, rules on charitable giving have made it harder for Muslims to fulfill their religious obligation. That is why I am committed to working with American Muslims to ensure that they can fulfill zakat.” Those pesky rules on charitable giving are in place to prevent Muslims’ ‘charitable giving’ money being used to fund terrorists. How unfair to Muslims!! Barry will fix it. Cairo, again: “…Holy Land…a place for all of the children of Abraham to mingle peacefully together as in the story of Isra, when Moses, Jesus, and Mohammed (peace be upon them) joined in prayer.” Whoa! How come Barry the Christian is telling a story inventedd by the Muslims in an attempt to make out like Jesus and Mohammed were best buds? AQnd how come Barry the Christian is saying “peace be upon them”? For Muslims, some things are reflexive – like saying “peace be upon…” whenever they utter the name of Mohammed. Oooopsie! Most telling is the New York Times article from several years ago, where the interviewer reported that Barry had recited the Muslim call to prayer in a “near-perfect” accent. That would be in Arabic. And that would be something Barry supposedly hadn’t heard since he’s left Indonesia 25 (appx) years before. But, but, but…he TOLD us he was never a Muslim. Oh, wait – that was before he told us he was a little bit Muslim, for a little bit. And he also told the Times’ reporter he considered the Muslim call to prayer one of the most beautiful sounds on earth. It could be confusing – except that it’s obvious he’s been a Muslim all his life. And that he’s a liar of the first magnitude. Finally, the infamous Imam Feisal Rauf claims to be the source of Obama’s speech to the Muslim world in Cairo. 9/11 Mosque Imam Wrote Much of the Guts of Obama’s Historic Cairo Speech! I do not merely THINK that Obama is a Muslim, I am CERTAIN that he is. Islam is a political ideology, not a religion in the sense that most of us are familiar with. Islam is all about one’s outward actions, not about one’s personal, emotional or spiritual relationship with the Supreme Being. Anyone raised by a Muslim father is considered a Muslim by the Muslims, and that is what counts. In addition, there is no chance that he could have avoided making the Shahada at some point. He still frequents the company of Muslims. His occasional denial that he is a Muslim is nothing but taqiyya. He might be a fairly lax Muslim in terms of personal observance, but he is a Muslim nonetheless. The only way I would consideer any former Muslim to be an ex-Muslim (i.e., an apostate from Islam) is if that person publicly renounces Islam, permanently eschews all further association with anybody associated with mosques, madrassahs, and the Muslim power structure, never again participates in any Muslim observance, and above all, never supports the Muslim agenda in any way, shape, or form, either at home or abroad. That means never taking the side of, or providing assistance to, any Muslim government or organization. I make no claim that Obama is a particularly “devout” or “observant” Muslim – only that he is a very dangerous one. This is a compelling and thorough list of slip-ups BHO has made since his election. (And it doesn’t even include what his wife, granda, and the Egyptian ambassador had to say.) Thanks. Slowly but surely, word about BO, and about islam and sharia is finally getting out. I just don’t know if it’s too late. I can’t help feeling a red-hot anger toward those who voted blindly for this menace, in the process giving our country away. potus that this country so igornatly elected in 2008. BR. If you would return the favor it would be much appreciated. Very nice site. We mustn’t forget as well, when Obama entered the White House the first thing he did was remove the bust of Sir William Churchill and have it sent from American shores back to England. Why would Obama despise Churchill? I wonder. Could it be because Churchill despised Muslims? Obama’s first TV interview in office: Al-Arabiya. Is he or isn’t he? Only his imams know for sure… — 1389 Blog – Counterjihad! What would Ubama be doing differently if he actually were a Muslim? 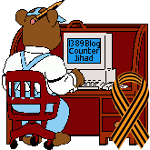 — 1389 Blog – Counterjihad!